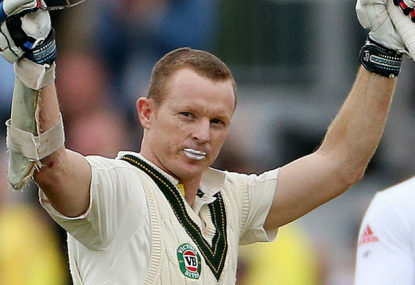 Chris Rogers looks nothing like an athlete. Short, red-headed, freckled, bespectacled, colour-blind, waddling to the crease smothered in protective gear and zinc cream as though an over-protective parent had just packed him off to the playground shielded from all conceivable harm. He looks like he should wear a wristband listing his allergies. He looks like he needs as asthma puffer built into his orthotic heels. He better fits the bill as a target of schoolyard bullies than a jock immune to their harm. He also acts nothing like an Australian batsman. A breed known for their love of dominance, for arrogance backed up by achievements, for disdain for the bowlers they face. Think of the curled lips of Ricky Ponting as he peeled off another century, or Matthew Hayden as he puffed out his chest and ladled another trio of unfortunate seamers toward the sightscreen. Think of players who respond to witty sledges with a flat stare and a “Who the f*** are you?” Think of the unshakeable press-conference talk that a big hundred is just around the corner. Then there’s Rogers. He has played each innings looking like he’s borderline terrified, like he was just wandering through the Long Room when a hilarious case of mistaken identity saw him strapped up with pads and ushered to the middle, just as Homer Simpson protested that he wasn’t a pilot while being forced into an airliner cockpit. Rogers does get airborne when he leaps at the crease to bring the ball to earth. He twitches and frets. First thing on the second day of the second Ashes Test, he flinched away from a James Anderson short ball and was hit in the neck. Next ball he squeezed awkwardly, almost desperately away to third man. But he was resuming after having batted through the entire first day, having spent the night not out on 158. The very next over he showed how he’d go there, putting in a full stride against Stuart Broad and producing a perfect off drive for four. The thing is, even those resounding shots hold a hint of reserve. They are Rogers digging deep within himself and yanking out the conviction to play them, forcing himself into action the way party wallflowers strike up conversations with their objects of admiration. He has built a career over nearly 20 years without ever seeming sure of himself. Heresy! Call down the inquisitors. Australian batsmen can’t admit to nerves, or hesitation, or any kind of weakness. But this one doesn’t care. He does it anyway, and he is a very nervous man. He was as nervous talking on the TV as he does playing on it. Under press conference lights he’s so pale and waxy that he could have been trucked across town from Madame Tussauds. The copious zinc cream is just so you can tell where his lips are, so tightly does he purse his mouth as he faces each delivery. Yet every time he starts an innings, he looks less like he’s walking out to bat than walking the plank. And now he’s walked the plank for good, ending a career that is disproportionate in how well loved he is compared to how long he was around. Twenty-five Tests over the course of two years. But a fine player he’s been: five centuries, fourteen half-centuries, and the Australian Player of the Series award for his last trip out in the baggy green. It’s his difference that has made Rogers so endearing. That idea about him being pulled out of the crowd isn’t far off the mark. He has an everyday quality, a humility created from a lifetime of graft in first-class cricket rather than afloat in a media bubble on a sea of adulation and rage. There could be few more popular entrants among the visiting names on the Lord’s honours board, either. When Rogers raised his century there, and again at his 150, the standing ovations from the largely English crowd were spontaneous and generous. Perhaps by then Rogers’ nerves were gone. When he thanked England at The Oval for the hospitality over so many years, the ovation was just as warm. He must be leaving Test cricket believing more that he belonged. The public reception isn’t just about a career with Middlesex, or Australia, the balls faced and runs scored. It acknowledges a triumph for modesty and honesty and ordinariness. Chris Rogers should never have become an Australian Test batsman. That’s why it’s for the good of everyone – short freckled nerds and natural athletes alike – that he finally did. A version of this article was first published on Wisden India.